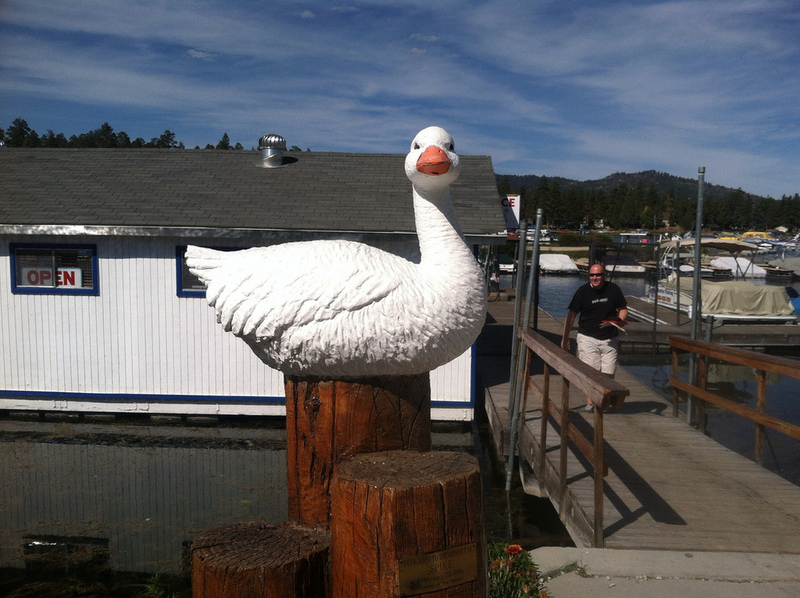 Getting Out of L.A. with Dan's Parents- A Morning on Big Bear Lake — Always Packed for Adventure! Dan had the great idea to rent a pontoon boat to explore Big Bear Lake. The last time that we were on the lake, Dan and I had rented a jet ski, which although a lot of fun, didn't allow us to take pictures or really enjoy the lake. Unlike last time, when it was so crowded that we lucked out to be able to get a jet ski for an hour, this time the marina was dead. It's always a good idea to book in advance, but we really didn't need to on a Friday morning in mid-September. The first thing that you see when heading to the boat office is this great statue carved from a piece of wood and a memorial for "Spike". We didn't rent the pontoon to go fishing, but here is the records for the lake. There are some big fish in that water! Dan has his boating licence, which was reassuring. He definitely drove the pontoon better than the guy working at the marina, who crashed it into the slip before handing it over to us. I am fairly certain that the marina doesn't require a licence to rent the pontoons, as it is such a tourist operation. They gave Dan a map and about five minutes of instructions before we set off into the lake. Let's head out for an adventure! This advertisement was a little late, as we had just left the marina. We had the rental for an hour, which was just enough time to go around the boundaries of the lake. Next time, it would have been nice to pack a picnic and have lunch on the water. We saw many things on the lake, like a flock of birds. A big observatory with a little observatory. Luckily, we escaped a pillaging. After the boat ride, we headed to the Big Bear Village shops. As one might expect, there are a lot of bear themed shops. I found the ultimate tacky bear themed item... it is never to early to think about Christmas Decor. The Holy Family in bear costumes. A bear in a camel costume? I tend to think that every object, no matter how ridiculous, has someone out there who would want it. The old adage, "One Persons Trash, it another person's treasure". Mine is a Billy Bass Fish that sings Chinese Happy New Year song, in Chinese. I couldn't imagine that my friends wanted to throw away something so awesome and I even painted my bathroom orange to theme around the fish. Not kidding. The orange bathroom was repainted within a month, after I dealt with mortified family and friends. I stand by my unusual home decor design. It was awesome. 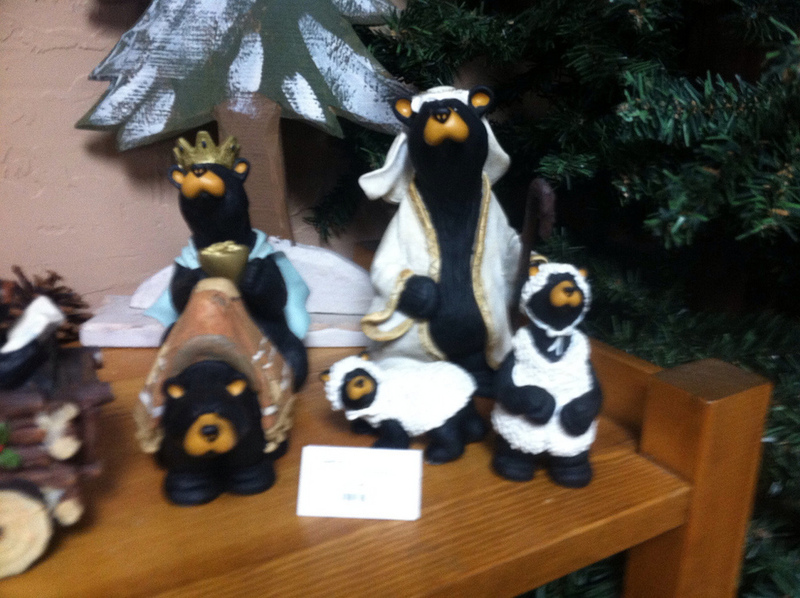 The bear nativity, I just don't get. Anyone who would have a nativity scene up for Christmas, won't want bears and anyone who would buy one with bears, wouldn't be the sort to have a nativity scene. I imagine this is the only one of its kind and it's gathered dust in the shop for years. I got a good laugh from it though. It's just so silly! Lastly, here is a picture of something that I NEED for our front window. So adorable! The cutest door decoration ever made.